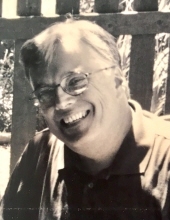 Celebrating the life of James Nash Jr.
Obituary for James Nash Jr.
James Greene Nash, Jr. (Jim), age 66, died of complications from dementia on September 19, 2018 in Boone, Iowa. Jim was born on May 10, 1952 in Grand Rapids, Michigan to James and Marilyn Nash. He graduated from Ashland High School in Ashland, Ohio in 1970 and the University of Iowa in 1974 with a degree in Business Administration. He worked in the restaurant industry from a young age, and after college began a long career with Pizza Hut. As he continued his career, he moved to Des Moines, Iowa where he met his wife of 36 years, Jean Nash (Clemens). Jim and Jean raised two children together, Jonathan and Katherine, who will miss his support and the example he set everyday just by being kind to everyone he met. Jim was involved in the Lions of Illinois Foundation and the Special Olympics through much of his life. He enjoyed helping others, hosting parties for his family, and making the floors in the house rumble with the Rolling Stones, Led Zeppelin, Bob Seger, or the Eagles. He was a lifelong fan of the Iowa Hawkeyes, golf, and waking up before the rest of the house to enjoy a strong cup of coffee and read the newspaper. He will always be remembered as an amazing husband, father, son, brother, and leader in his community, and someone who always lived the values he taught others. Jim is survived by his wife, Jean Nash; his son, Jonathan (Brianna) Nash; his daughter, Katherine Nash (Linsey Hammett); his mother, Marilyn Nash; his brother, Tim Nash (Jenifer Davis), his two sisters, Julie Nash (Van Harris) and Amy Walter (Shawn), his two grandsons, Declan and Patrick Nash, and many cousins, nieces, and nephews. He is preceded in death by his father, James Greene Nash, Sr., and two beloved dog friends, Murphy and Zack. A Celebration of Life is scheduled for Jim on October 28, 2018, 2-5pm, at the Bright-Grandview Golf Course in Des Moines, Iowa. Family and friends are welcome to attend and celebrate Jim’s life, share memories, toast to a great man, and spend some time on the putting green. Any memorials can be directed to the Mass General Institute for Neurodegenerative Diseases in Charlestown, MA. To send flowers or a remembrance gift to the family of James Nash Jr., please visit our Tribute Store. "Email Address" would like to share the life celebration of James Nash Jr.. Click on the "link" to go to share a favorite memory or leave a condolence message for the family.